The Government yesterday defended its decision to issue a gazette notification declaring four forest areas bordering Wilpattu as a forest reserve claiming it was an attempt to increase the country’s forest cover. 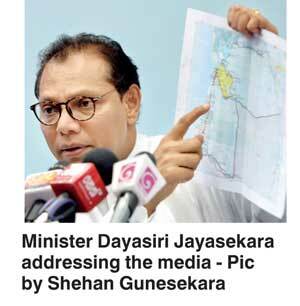 Speaking to the media, Minister Dayasiri Jayasekara emphasised that the President signed the gazette in the interest of the environment and appealed to the public not to make this a communal issue. Earlier this week, President Maithripala Sirisena signed a gazette notification declaring four forest areas of Mavillu, Weppal, Marichchikadi-Karadikkuli, Vilaththikulam and Periyamurippu as the Mawillu Forest Reserve. The move received backlash from different quarters, prompting the President’s office to issue a clarification on the matter. Making a special mention of the settlements in the Marichchikadi and Vilaththikulam areas, Minister Jayasekera reiterated that the gazette will not affect settlements, cultivation land, paddy fields, private properties or mosques. He stated that the gazette was to clearly demarcate between forest reserve and human settlements. “If anyone has been unfairly treated because of this gazette notification, we can work to address this within the gazette,” he said. The Minister said that resettling the large number of persons displaced in the war was a priority, and the Government has taken steps to address this. However, he also stressed on the need to protect the environment. “Today, forest cover in Sri Lanka has reduced to below 25%. A number of programs are taking place under the President’s leadership as a part of the Government’s sustainable development program. The objective of this program is to increase this forest cover up to 35% by protecting forests and wildlife,” Jayasekera said. He added that the new gazette was in line with this program and does not discriminate or target a specific community. With regard to the outcry against the Government move, the Minister alleged that certain forces were spreading misconceptions and misinformation against the President’s decisions. He claimed that these forces are attempting to distance the Muslim, Tamil and Sinhala communities from the President, and promote racism. When quizzed, however, the Minister refused to identify these forces.